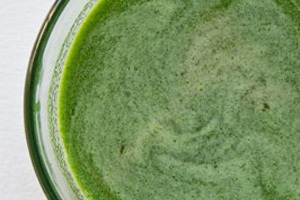 This recipe can be used with almost any fresh herbs to make a tasty and colorful dessert sauce or cocktail mixer. Here we’ve used the most popular dessert herb, mint, but you could substitute any variety (completely trimming the stems if they’re woody) that works with the other flavors in your dish. 1. Make a Simple Syrup with the water and sugar. Remove it from the heat and chill it completely. 2. Blanch the herb leaves in boiling water for about 30 seconds. 3. Immediately transfer the leaves to an ice water bath to shock them. Once they have cooled completely, remove them from the water. Squeeze out any excess water. 4. Puree the blanched leaves together with the simple syrup. Strain through a fine mesh strainer. 5. Store the syrup in the refrigerator until you’re ready to use it. Mint syrup is particularly tasty with ice cream.